Which side of the lettuce fence do you stand? The lettuce fence would be very wobbly and wouldn’t last long, just think of all those rabbits charging in and demolishing it! But never mind, you know I’m not being literal, don’t you…. Are you a soft and ruffled oak leaf lettuce chomper, a crisp round iceberg muncher, maybe you err on the side of baby gems or prefer to nibble on the wintry bitter taste of Radicchio, maybe a frilly Frissee tempts you, perhaps looseleaf fits your style, or is melt in your mouth butterhead your thing, or are you an upright crunchy Cos/Romaine kind of person? Whatever your lettuce, I bet we all have a favourite way to eat, dress and prepare these leaves. Is it a splash of balsamic or a squeeze of lemon? Is it just “plain” leaves or do you chuck the contents of the fridge into the salad. Then there is the tricksy question of timing, do you start your meal with a salad, eat it during, or is your ideal to finish your meal with greens? I can’t decide if I find lettuce the easiest thing to grow or the trickiest. In the heat of summer when you crave fresh leaves and no cooking meals they have a tendency to bolt whilst in winter they can turn up their feet and suffer from frost. If I paid more attention to varieties and sowing dates I might have more answers; Eliot Coleman’s Four Season Harvest and Charles Dowding’s Salad Leaves For All Seasons are packed with information, I just never seem to manage to put their wise words into action at the right time! 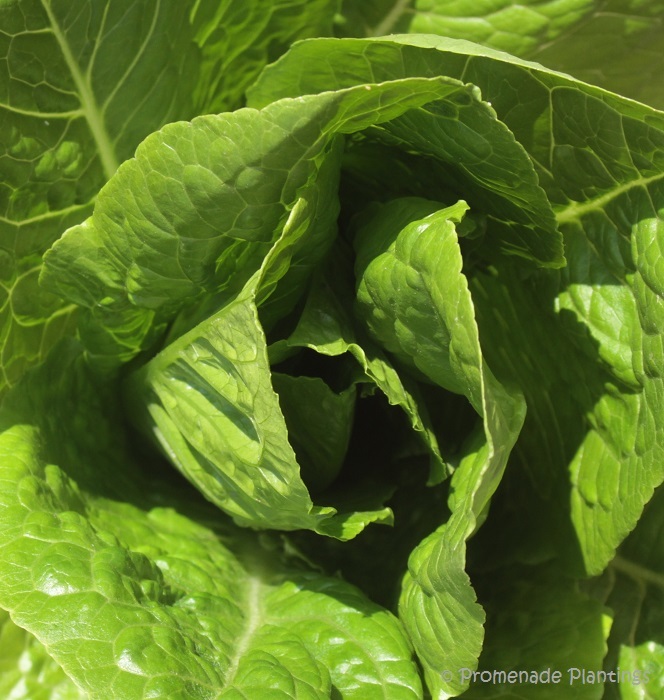 The newest addition to the Promenade is a French variety Verte Maraîchère a Cos / Romaine lettuce which is perfect for cooler season growing, but seems to be doing splendidly in the dry early heat of summer on the allotment. the one thing I am trying this year is to grow lettuce with the cucumbers and radish – apparently they are prefect companions, I know they taste good on the plate together so I don’t see why they shouldn’t get on when growing. 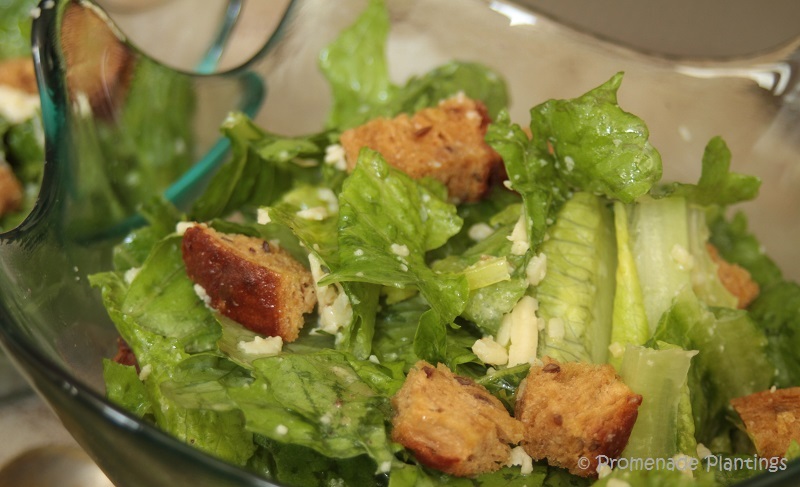 So while the lettuce debate rages 🙂 I’ll leave you with a classic Caesar Salad. The best description I’ve ever read about how to prepare the salad comes from blogging buddy Sharyn of the Kale Chronicles, it starts “The salad that makes me set aside my food aversions is truly magical” and proceeds to tell us exactly how to prepare the salad, including the type of bowl to use. The one thing I’ve never managed to do is to crack the coddled egg directly into the salad, something squeamish in me stops me short. Maybe I don’t have enough confidence in myself to mix the egg yolk in properly or whether it’s the fact that it’s only partly cooked that stops me, but either way I cheat and crack the coddled egg into a small bowl and whisk it separately before I add it to the leaves. Oh, and I don’t use a wooden bowl…..
and to answer my own question, it’s a Romaine……..
And if it’s too late and your home-grown lettuce has bolted, you can always make lettuce soup! Lovely post Claire. My youngest daughter, Emma, LOVES Caesar salad. My brother is a chef and owner of a fabulous Italian restaurant. Because a Caesar is not Italian, he does not have it on his menu. And of course, every time we go there, Emma asks her zio, in her see test voice, if he could make her a Caesar. And of course, he does. After having checked out the Guardian recipe, I will have to make it for her. I like BOTH crunchy and softer, leafy lettuces. As to making my own Caesar dressing … Kraft does a good enough job for me. 🙂 I have been known to make my own croutons though. I shake my head when I see the packages of pre-seasoned croutons as they’re so easy to make yourself. Don’t get me started on the “kits”. I am a Romaine kind of guy! My lettuces were finished in late April here. I have never thought of nor tried a Caesar salad with anything else but I may have to expand my views! Romaine is my favorite lettuce for a caesar salad, but as long as there are anchovies, I don’t care what kind of lettuce is used. Love your questions and debate on something almost everyone has grown and most have overlooked as a topic of conversation! I am a melt in your mouth butterhead fan and a Cos/romaine fan too. I agree with you 100% that in the main summer season, lettuce from the garden seems to be gone (all eaten or bolted). I have read many times how to start it every couple of weeks but I don’t get to it. Maybe it is because other crops become too distracting or the heat take some of the zip out of me… Anyway, love this post and will check out the recipe. I too, am cautious/queasy with eggs so not sure if this may be a little to daring for me. Lovely photos too! Crunchy, fresh and watery all in one! What a timely post Claire! Like many other readers here, I too love them all. I love the mix of textures, colours and flavours, and am happy to have whatever the garden is offering at any time of the summer. We’re in the midst of a heatwave, so many of my lettuces are bolting right now (must check out that recipe for lettuce soup! ), but another crop will be coming along in a little bit. I love greens entirely on their own with a bit of olive oil and lemon, and the simple dressing that I use again and again is just olive oil, white wine vinegar, a bit of dijon mustard, salt and pepper. Hi Claire, I read the link with interest and the debate about whether to stick with the authentic recipe. I hate it when people vary a classic recipe but still call it by the classic name. Be as adventurous as you like but call it something else. I have been to a restaurant where they served Caesar salad with sun dried tomatoes in it! Heaven forbid. I like all lettuce but for Caesar I like Cos.
Well, cos is the lettuce I first used to make Caesar and I have remained true!! Love it as a simple first course! How to make it – please do not laugh if you have already not discovered this – Gordon Ramsay has a newish wonderful TV series/book out on ‘Ultimate Home Cooking’ [never a ‘f . .k’ in place: cooks with his four children!] 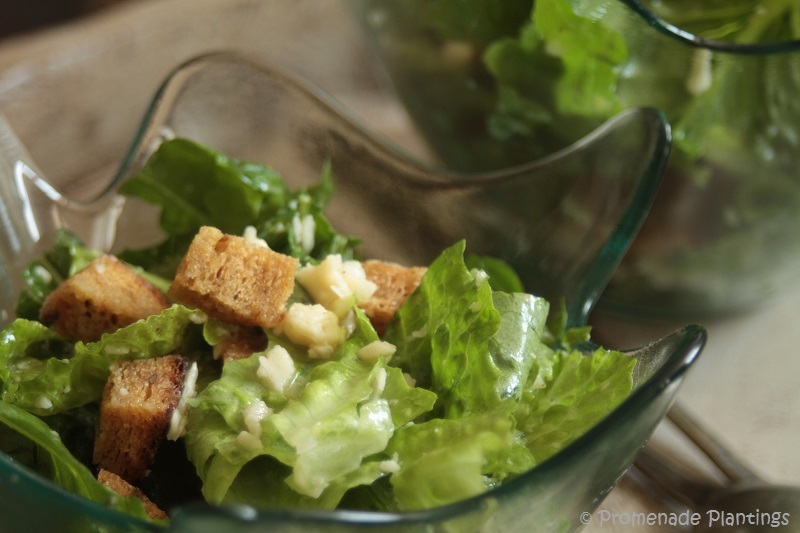 – that has a wonderful Caesar salad recipe just with interesting croutons and cheese: lively, modern, simple, moorish!!!! Fully agree with Glenda about using classic names but not the classic recipe!!!!!! What a lovely post Claire. If I had to chose, it would definitely be a baby gem – best of all the worlds – nice and crispy, not bitter, can balance scrumptious goodies in a single leaf or use it in a traditional salad or add it to a sarmie. Cos for Caesar salad, but for an everyday salad I throw everything at it, including nuts and dried fruit and raw veg, cucumbers and tomatoes. I make my own dressing, usually fresh every other day. But now I have an urge for a proper Caesar salad! I love all varieties of lettuce but Romaine is my all time favorite. Have a great weekend Claire! Romaine for Caesar Salad. “Anything goes” for the rest! I planted an assortment of lettuces in an EarthBox, but they did indeed bolt. We had an early heat wave, and that, as they say, was that. I like romaine as well. Iceberg is probably my least favorite. Your pictures are lovely. Claire I do not think I have ever had a Caesar salad with any lettuce other than Romaine? I will now give it a try with some of the other types you mentioned. I bet it would be fantastic with Arugula as well? My lettuce season is long gone here in Tennessee. We are having 90 degree F weather and no lettuce I know can survive that. It is hard enough for people! Great photos. You’ve put out a few lettuces I’ve never heard of. I’m a spinach and rocket person really but I do enjoy the crisp wateriness of good old iceberg. Romaine is our lettuce of choice for Caesar and I have one kid who lives on them. 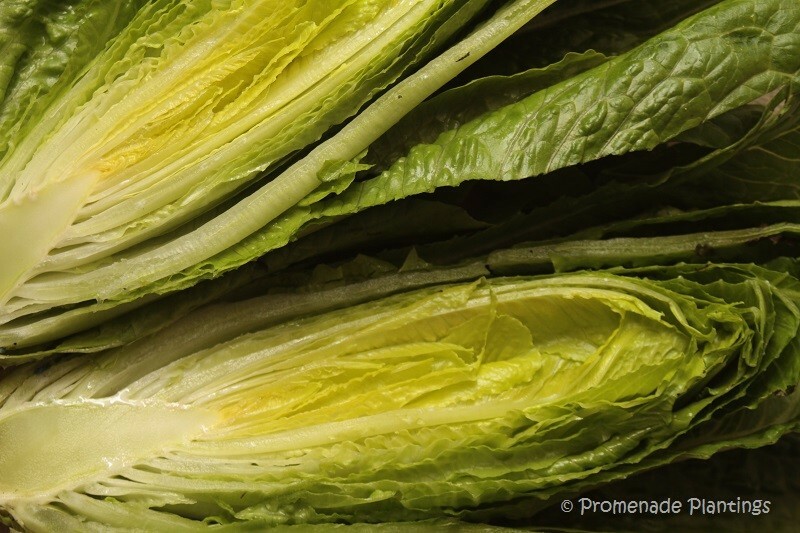 Romaine for the crunch! Love your lettuce pics. One interesting salad variant that I’ve not tried to prepare myself but have been served deliciously is *grilled* Romaine. When I had it, it was simply split down the middle of the cleaned head (base intact enough to hold its form), grilled over open flame until very lightly charred and slightly softened, and served with a Caesar-like or creamy vinaigrette dressing, Gorgonzola crumbles and toasted walnuts tossed on top. Fabulous. I’ve had grilled radicchio as well, and more often, and like that too, so I imagine any of the sturdier greens (including kales, cabbages and their ilk) might well make a fine salad, treated thus. Not that I’ve any objection whatsoever to a good and utterly uncooked green salad! Viva la lettuce–I love them all. I am fond of the bitter ones especially with lots of olive oil and lemon. Happy lettuce chomping!